Vancouver, BC / Coast Salish Territories - This morning six people directly intervened in the Enbridge pipeline joint Environmental Assessment and Energy Board hearings and put climate change on the agenda . 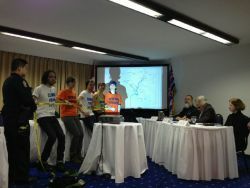 The group managed to make their way past police undetected and into the secured 4th floor of Vancouver’s Sheraton Wall Center. Once inside they revealed shirts emblazoned with messages like “Stop The Pipelines” and proceeded to use police tape to cordon off the hearing area as a “climate crime scene”. "Climate change is killing thousands of people every year, primarily in developing countries and Indigenous communities that are the least responsible for creating this problem. Despite this fact, the Joint Review Panel has instructed those participating in the hearings not to talk about climate change. This is a shockingly irresponsible move considering Canada’s tar sands contain twice the amount of carbon dioxide emitted by global oil use in our entire history. New fossil fuel pipelines are an irresponsible step in the wrong direction.” said Sean Devlin. The impacts of climate change have been drawing global attention recently, between Hurricane Sandy, unprecedented deadly typhoons in the Philippines and previously unimaginable temperature records in Australia. In this urgent context the JRP has designated climate change and the carbon emissions of Canada’s tarsands “outside of the panel’s mandate”, a move that officially discourages intervenors from raising these critical issues during their oral statements. “Enbridge and the federal government are using their position of authority within this process to coerce members of the public into silence on these issues. The majority of First Nations and settler communities in the province oppose fossil fuel pipelines. We respect those who are voicing their opposition to the pipelines inside the hearings, but the hearing process is meaningless, especially since Harper has changed the law, giving his cabinet final say on pipeline projects." Said Fiona De Balasi Brown. Today marks the second day of the Joint Review Panel hearings in Vancouver and the second day that the members of the public have crossed police lines to make their opposition heard. On Monday more than a thousand protesters peacefully forced their way past police onto the Sheraton property drumming so loudly the noise could be heard inside the hearings. Public outrage has been emboldened by a decision to exclude the public from the hearings in Vancouver, a move the BC Civil Liberties Association criticized yesterday as “potentially unlawful”.